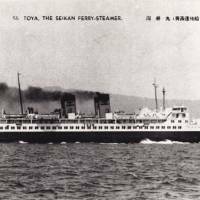 On Sept. 26, 1954, the passenger ferry Toya Maru, 7-year-old pride of the Japanese Railways-owned fleet plying the cold blue waters of the Tsugaru Straits between Hokkaido and northern Honshu, sank in a typhoon with the loss of more than 1,200 lives. Barely 150 passengers and crew survived. To this day, the 1912 disaster in which the iconic White Star liner Titanic struck an iceberg and sank in the North Atlantic with the loss of some 1,500 lives defines the scale of civilian tragedies at sea. 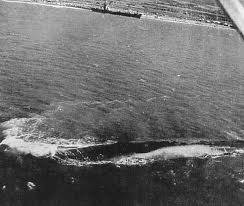 However, the loss of the Toya Maru (pictured above) — the worst such disaster in Japanese history — comes tragically close to that. 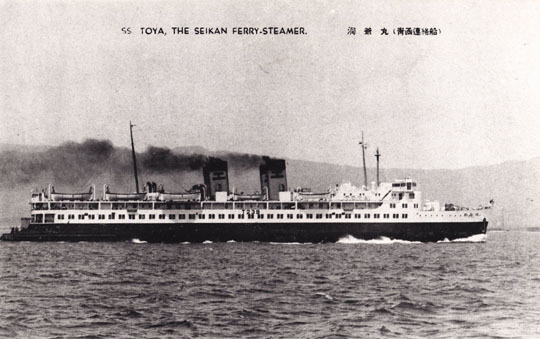 Compared to the Titanic, though, the Toya Maru tragedy is a historical footnote that is unknown to most young Japanese. Nonetheless, the ferry’s sinking nearly 60 years ago cut an enormous fatal swath through the ranks of Hokkaido entrepreneurs involved in fishing, mining and agriculture, as well as families from Aomori Prefecture in northern Honshu and 35 GIs from the U.S. First Cavalry Division. In fact, an American officer who saved a fellow soldier before he himself drowned was posthumously awarded the Soldier’s Medal, the highest U.S. non-combat military decoration. But that same ferocious typhoon claimed many more lives, too, as four other ferries and around 200 small fishing craft sank that day. 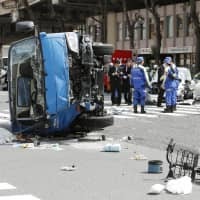 In addition, Hakodate port in southern Hokkaido was badly damaged, while the island’s vital fishing industry was crippled for months — in much the same way as this year’s Great East Japan Earthquake and tsunami on March 11 wiped out much of the fishing industry in notheastern Honshu’s Tohoku region. 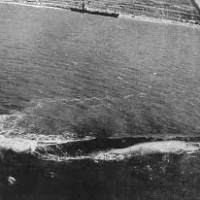 With all those losses at sea, and with only rudimentary air traffic in those days (a relative of this writer who flew to Chitose Airport outside Sapporo in the early 1950s was surprised to find his name printed in an “Arrivals” list in one of the city’s newspapers), the typhoon left Hokkaido virtually cut off from Honshu. 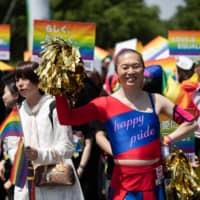 Besides the inconvenience, this frightened many Hokkaido residents who recalled that, only nine years before, planes from a U.S. aircraft carrier sank ferries in Aomori and Hakodate harbors and left Hokkaido isolated prior to a feared Soviet invasion. As a result of the Toya Maru sinking, the Japanese government accelerated planning for the 54-km Seikan Tunnel under the Tsugaru Straits. That rail link finally opened in 1988 — ironically, just as passenger jets were coming to dominate inter-island travel. On a personal note, I well remember the Toya Maru disaster being a dinner-table topic during my childhood. That was because, during the 1950-53 Korean War, my father was with the U.S. First Cavalry Division based at Chitose when he met and married my mother, a Hokkaido native. For some inexplicable reason, he would tell us, he decided not to board the Toya Maru as he’d planned to that humid September day to get him to Camp Hogan outside Hachinohe in southeastern Aomori Prefecture. Instead, he said, he took a plane the next day to that Tohoku port city on the Pacific — the place where I would be born, and which was the northernmost city damaged by the March 11 tsunami. My parents also spoke about friends who boarded the Toya Maru and never returned. My father had a 20-year career in the U.S. Army and survived two wars, but like a bad dream that played over and over in his mind, he could not forget how close he came to a frigid death by drowning outside Hakodate harbor. I have often thought of an “alternative” life: If my father had boarded the Toya Maru, five months later I would have been born fatherless. I would have grown up in 1960s Chitose, a city then with a strong American military presence — a northern version of Okinawa. Perhaps in my teens I would have pleaded with my mother to let me visit relatives on the second-largest Hawaiian island of Maui. Then, perhaps, after finally meeting my American relatives there, I would resolve to return to Maui. So, decades later, I would be living a new life far away from chilly Hokkaido. Of course, that “other life” is pure conjecture, but fate still has a way of throwing up surreal surprises. So it was that, after the March 11 disasters, my wife and I decided to leave Japan behind and move to calmer, safer Hawaii. In August, I joined the University of Hawaii Maui College, located in the sugarcane port town of Kahului — the same town where my grandparents arrived from Japan more than a century ago, and the place where my father was raised. Strangely, then, I have returned to Maui, the beautiful mid-Pacific island that I had been destined for — whether or not my father had boarded the ill-fated Toya Maru. Ray K. Tsuchiyama is Director of Institutional Advancement at University of Hawaii Maui College.